Uruguay has long been overlooked – or perhaps forgotten – by travellers thanks to its imposing neighbours. This small nation, however, is quickly gaining a reputation as a safe destination with so much to offer. Montevideo combines a relaxed attitude with a rich cultural scene reminiscent of Buenos Aires, and its bustling old town is home to many Art Deco buildings . 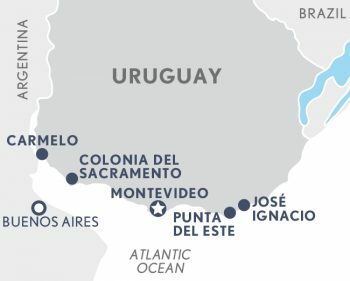 Outside of the capital, most of the action takes place on the Atlantic coast, be it in one of the many beach towns like Punta del Diablo or in Carmelo, located just up the Rio de la Plata. Uruguay’s interior provides a different experience altogether, with rolling green hills and small communities complete with authentic ‘gaucho’ horsemen. A journey through Uruguay really is a journey through time. This is a destination for those partial to a slower pace of life, a place where long lunches take priority over long lists, and food, wine and culture pervades all. Learn about Uruguay’s intriguing history in the World Heritage-listed old town of Colonia del Sacramento, where cobbled streets stretch down to the spectacular riverside sunsets. Visit the small town of Carmelo, the gateway to Uruguay’s small, but delicious, wine region. Taste Uruguay’s answer to malbec, tannat wine, at small bodegas found off dusty roads. Explore the cool, calm streets of waterfront Montevideo by bike and soak up Uruguay’s rich culture through the eyes of local craftsmen, the beat of a renowned drummer or in the soul-stirring steps of the tango. Rub shoulders with the locals in neighbourhood cafes and the impressive Plaza de la Independencia. Relax in understated elegance at Charco Hotel, located on the banks of the Rio de la Plata. Oozing colonial charm, this boutique hotel boasts expansive views of the river from its high-quality bistro – one of the best dining experiences in Colonia del Sacramento. Immerse yourself in Uruguay’s culture at Alma Historica, a restored 1920s townhouse in that pays tribute to the country’s famous writers, athletes musicians and artists. Its envious location is complemented by a rooftop hot tub, from which you’ll have views of Montevideo’s pretty old town. Uruguay is a year-round destination enjoying a similar climate to that of Southern Australia. The summers are hot and the winters can be cold, with Montevideo experiencing an average temperature range of 7–28 degrees over the year. Pocket-sized but packing a punch, Uruguay is a relatively undiscovered South American country located just across the River Plate from Argentina. Situated in a fabulous location on the banks of the Rio de la Plata, the Charco Hotel is a small and elegant boutique hotel. Located close to Zabala Square in the old city the elegant Alma Histórica is a restored 1920s townhouse turned elegant lodging. Rooms are individually designed and pay homage to legendary native artists, writers, athletes and musicians.